ballwalkpark is changing the vaccine protocol for clients. We no longer require annual vaccine certificates, and will gladly accept titer testing in it's place. Titer testing is recommended every 3 years. The only vaccines that are required are the 3 series of puppy shots and rabies every 3 years. We strongly encourage you to read through this blog post and inform yourself about vaccinations so you are able to make the best decisions for your pup. If you decide that you don't want to change anything, that is not a problem at all, but we don't want to be the reason you are vaccinating if you aren't comfortable with it. Why Do We Vaccinate Annually? When illness follows, it’s often long enough after vaccination that the event is forgotten or negated as being causative. Until the questions are directed to “when did this illness begin?” A British vet discovered, by asking this very question of his clients, that 75% of his respondents answered that their dogs started itching about a month after their vaccines. Dr. Richard Pitcairn, the vet who taught many of us homeopathy, wrote about the relationship between vaccination and the chronic disease it induces here, in a paper presented at the AHVMA conference in 1993. It’s a remarkable treatise on how dogs vaccinated against distemper or rabies often develop chronic symptoms of either or both diseases. 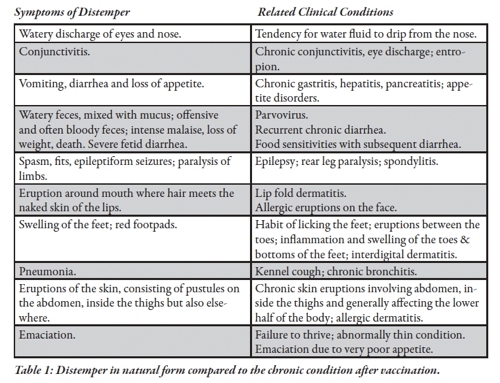 Here’s his chart showing the natural symptoms of canine distemper compared to what we commonly see as symptoms in chronically ill dogs. Your vet may offer titer testing, but in about 10 calls I made to local Seattle vets, it doesn't seem to be a routine practice. it is also pretty expensive at local vets. I recommend having your vet do a blood draw and then you send it off to HemoPet, which is run by Jean Dodds. You fill out this form, send in the blood, and wait for the results! With this information, you can make your own informed decisions on what vaccines your pup needs. As far as Rabies, you can have Dr. Dodds write a waiver of rabies booster, with justification by client veterinarian, with rabies antibody titer recorded, may be granted. Bailey's cancer has opened my eyes to a ton of things regarding dog health and nutrition, and vaccinations are one of them. I had no idea how relevant this was to not only all of my clients dogs, and my dogs, but my dog's cancer too. Considering how much time I spend driving every day, I can't believe that I just discovered podcasts. One of the first ones I listened to on Animal Talk Naturally - it's called Vaccine Induced Disease with Dr. Patricia Jordan. You can listen to it here. I was so fascinated by this blog post that I set up a consultation with Dr. Jordan to discuss Bailey and her cancer. If you have questions about vaccines, cancer, natural health, or nutrition, I highly recommend you contact her as well. She spent nearly 2 hours on the phone with me and send me 4 page Word document summarizing our talk with links to every source! Basically what I learned, was sarcomas (Bailey's cancer) are linked to vaccines almost 90% of the time. They are caused by heavy metal poisoning from the vaccines and just a total disruption to the body. She gave me some helpful tips for how to help detox Bailey, but the most important thing I took away from our convo was that I needed to spread the word to my clients. In Bailey's 9 years, she has received Rabies 3x, Distemper-Parvo 6x, Bordatella 4x and Lepto 3x. That's 16 vaccinations in 9 years. And believe it or not, she is actually under vaccinated for a dog her age - blame that on me being a broke college kid for her younger years. Looking back at Bailey's vet records, I brought her into the vet 4 days after her last puppy shot series because she had been throwing up for 2 days. In the notes they commented on her recent vaccines and suggested possible vaccinosis (vaccine reactIon), but this was never mentioned to me. Had I known that she was sensitive to vaccines, and had I known there were alternatives, I could have made better choices for her going forward. Based on Dr. Jean Dodd's new vaccine protocol, which is the new standard for vaccines accepted by The Canadian and American Veterinary Associations, and all 27 vet colleges in North America, she should have Distemper-Parvo 2-3x, Rabies as a puppy then every 3 years after, and that's it. For Bailey's 9 years, on this new protocol, she would have been vaccinated 7-8 times, assuming she showed positive titers. After listening to Dr. Jordan's podcast, there are several clear links from vaccines to sarcomas, and there is no doubt that is what put Bailey on this path. Every dog is different, and hopefully most will handle these vaccinations better than my little girl. Knowledge is power, and it is up to you to advocate for your pup. I hope this post will help you make better informed decisions about what's right for you and your pup. Posted on March 3, 2014 by ballwalkpark and filed under Dog Health and tagged health vaccine vaccination vaccine policiy dr. jean dodds vaccine protocol dr. ron schultz dr. patricia jordan dog health cancer.